The light was amazing, a very nice soft light. In addition there were quite a few Barnacle Geese around, which seemed to be very jumpy and flew up quite quickly. 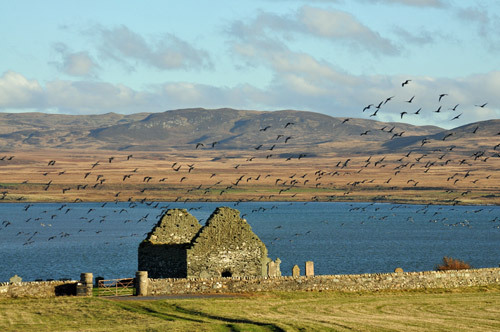 I took quite a few pictures here with large flocks of the geese in them, this one shows them passing the ruin of Kilnave Chapel. That's all I have for tonight, as usual I will post a larger version of the picture on the Islay Pictures photoblog on Saturday morning. Good night and have a great weekend!